Summer is drawing to a close. The nights are getting cooler and the kids finally head back to school next week. In another month or so, the rainy season will descend upon us here in the Pacific Northwest and so with our last days of yummy summer sun, the boys and I have been doing our best to enjoy the great outdoors while we still can. But because I have pale-skinned children, this means a thorough slathering in sunscreen before we head into the sunshine, and not only because it makes them smell like coconuts. That’s just a nice bonus. So I felt misled. I decided to do a little digging into this substance we call sunscreen. There are a few references to innovative sun protection throughout history. Historians think the Ancient Greeks used sand and oil to protect their skin from sun damage as early as 400 BC and quite a few years later, sun block gets another blurb when Christopher Columbus journals about the paint the natives use to protect their skin from the sun. The first widely used chemical sunscreen was invented by Benjamin Green, whose “Red Vet Pet” was worn by soldiers in the Pacific during WWII. Green’s early attempt would later become a Coppertone product. A handful of others invented basic sunscreens around the same time and they all had one thing in common. They didn’t work particularly well. So now skip ahead thirty or forty years of growth and development in the industry and a huge increase in the rate of use in the general public. The other thing you will find is an increase in the rates of melanoma skin cancer. So if sun exposure causes skin cancer and sunscreen causes skin cancer and we’d really rather think of ourselves as the slim, athletic, outdoorsy type with a healthy sunny glow instead of the overweight, unhealthy, couch potato that most of us probably really are, then what do we do with this information? First we need to examine exactly what we know. There really haven’t been reliable studies that have shown more than a correlation between the use of sunscreen and an increase in the occurrence of melanoma skin cancer, meaning that what we are probably seeing is that with greater sunscreen use, comes greater overconfidence. What people tend to forget is that sunscreen is not recommended as the frontline defense for harmful sun exposure, but rather avoidance is the key. Current recommendations from the American Academy of Pediatrics state that kids (and their parents) should wear tight-weave clothing in the sun, avoid spending much time in the sun during peak hours, wear hats with brims that shade the face and don sunglasses that offer broad spectrum protection. Sunscreen with a minimum SPF of 15 (and higher is better) is a good idea, too, but studies do show that most of us don’t use it the way we should and relying on it too heavily may encourage people to make poor decisions about sun exposure. It’s more likely those poor decisions that are the real culprits of higher cancer rates. Sunscreen is not designed to be absorbed into the skin and so harmful chemicals leeching into our systems seems improbable and sunscreen in the US is regulated by the FDA, and so is subjected to the same level of testing as the newest drugs for say hypertension, depression, or birth control. BUT if you still don’t trust it because you can’t pronounce the ingredients, I don’t blame you. A wise physician once said that the best sunscreen is the one a patient will actually use and there may be some more natural options out there. The most promising natural sunscreens come from the study of biomimicry (imitating nature’s best ideas). It’s pretty ingenious actually. Basically there are some problems that arise from living on this planet and a lot of natural adaptations that make it easier to cope. Biomimicry suggests that nature may already hold some of the best answers to our most perplexing challenges. In Part 2 of Man vs. Wild’s Indonesia, the Castaway episode, adventure survivor Bear Grylls introduces the use of a mucous produced by the mushroom coral as sunscreen. In the show, Grylls simply picks up one of these unanchored corals, tips it a bit to catch some of the slime, and places the animal gently back into the water, no harm done. He goes on to slather his already sunburned shoulders with the stuff while explaining that it has an SPF rating of somewhere around 50. And experts agree. It’s great stuff, but given that the mushroom coral is endangered, large quantities might be hard to come by. Another promising option may come from hippos. These deceptively adorable creatures (they’re actually quite deadly) produce an oily red secretion, referred to as “hippo sweat” that not only provides protection from the sun, but may also serve as a highly effective insect repellant and antibiotic. The main problem with it, of course, is that it’s difficult to pick up a hippo and pour off its sweat. On an episode of Dangerous Encounters, Brady Barr (National Geographic’s resident crazy animal guy) devised a scheme to collect the allegedly useful “sweat”. Wearing a nearly 200 pound reinforced hippo decoy suit, Barr attempted (spectacularly unsuccessfully) to get close enough to wild hippos to collect a sample. And since a fair few of you probably don’t have a reinforced hippo suit hanging in your closet, this may not be the ideal solution either, but then, I guess, luck favors the prepared. Still, perhaps the biggest obstacle in marketing “hippo sweat” sunscreen is that it apparently smells like, well, a hippo. 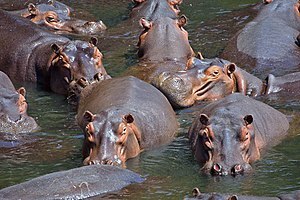 Considering that these large animals spend most of their days literally up to their eyeballs in mucky water, I’m guessing they smell less than fresh. At least for now, I’d rather smell like coconut. By the way, if you would like some better information about skin cancer, check out this great blog created by Katie Wilkes, a 20-something melanoma survivor I recently had the pleasure of meeting. And, yes, I’m pretty sure she smelled like coconut, too. I think that the correlation between sunscreen use and skin cancer can be explained by an increase in awareness. As sunscreen companies market their products as protection from the sun, more people start wondering about past damage and go get it checked out, in turn causing there to be more instances of melanoma. There may be some truth to that, not that being more aware causes the melanoma, but that there is an increase in diagnosed cases. I’m not convinced that’s a bad thing since melanoma is dangerous and it’s one type of cancer we are fairly certain we can prevent with altered behavior.